The department of Mechanical Engineering was established in the year 2000 which offers B.Tech. in Mechanical Engineering of four years duration. The intake capacity of the department is 60 students. Mechanical engineering is a creative discipline that draws upon a number of basic and applied sciences to design, build and optimize the devices, machines, processes, and systems that involve mechanical forces, work and energy. The department comprises of highly experienced faculty members who are working for the welfare of the students and the department. Department is fully equipped with latest and advance laboratories. Teaching beyond curriculum to enhance practical knowledge. Exposure to industries through periodical industrial visits and ambient opportunities to take up industrial attachment or apprenticeship. Placements in the Govt. and Private sectors like Army, Merchant Navy, HAL, Tata Motors, Honda etc. To become a center of excellence in Mechanical Engineering, producing innovative and creative mechanical engineers to meet the global challenges with social and cultural responsibility. To develop alliances with world class R&D organizations, educational institutions, industry and alumni for excellence in teaching, research and consultancy practices. 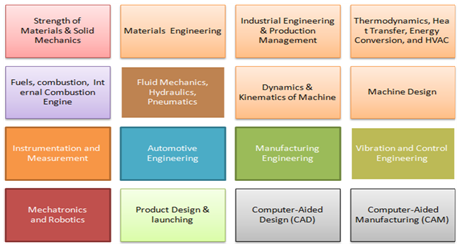 After the completion of the course in mechanical engineering, lots of opportunities are there in various fields of manufacturing, production, services and development. This is the age of machines and where, there is machines, there is opportunity for mechanical engineers. A fresher with the Mechanical Engineering degree can get the offer of salary started from 2 lakh per annum up to 5 lakh per annum. There is no criterion of salary for the brilliant or experienced candidate.